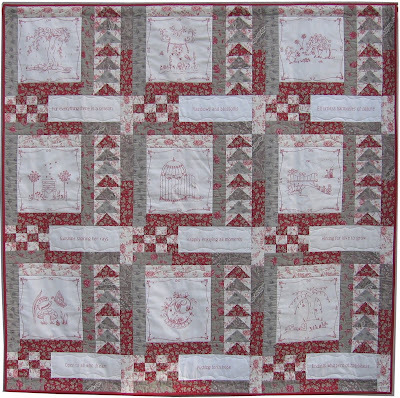 As sweet as cinnamon: 'Springtime' Fresh Hope redwork quilt revealed. have been keeping for nine or so months. Here is my block that I drew and stitched. have an opportunity to grow in love. and start the journey of life with a fresh hope. They have come out of their winters and have come into springtime. from a different perspective. A Fresh Hope perspective. I then stitched away at a verse of the poem. a Spring time for all to enjoy. Winter has gone ‘Springtime’ has come to Fresh Hope. and the inspiration behind them. What a wonderful idea!! I love the block you designed. Dawn it is so sweet - this was an amazing effort and you gals did it with such class! Love the poem and the stitcheries! Dawnie-love, your heart for those in need always shines through!! You have a generous spirit and a giving nature - I know that was the inspiration you drew on as you cut and stitched all our redwork blocks into their peiced frames! Love you heaps, girlfriend!!! 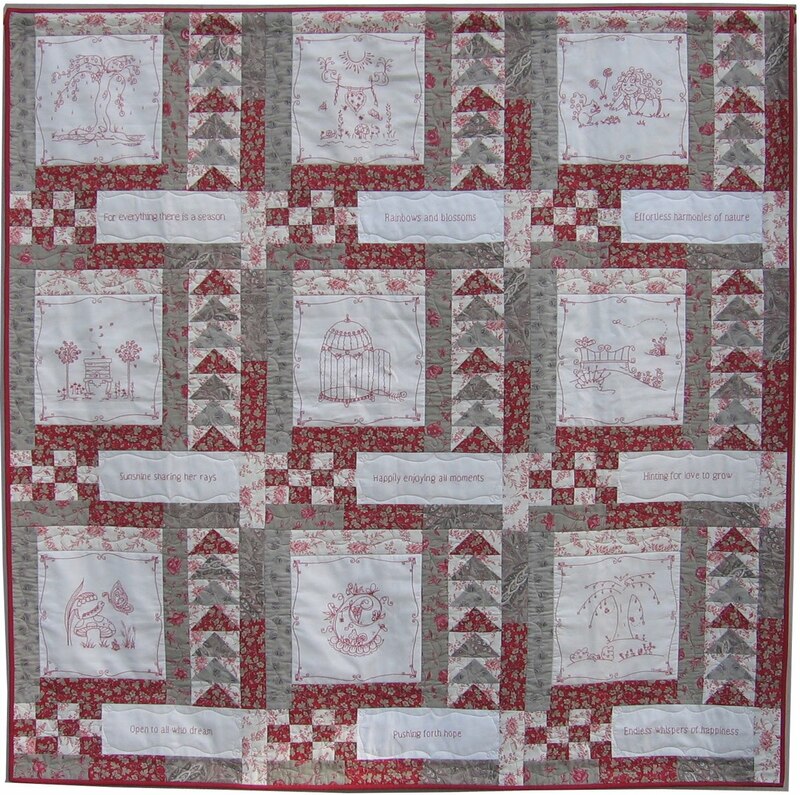 Darling Dawnie ... you lovingly stitched our blocks into one big beautiful quilt. And what a wonderful job you did of it too. You truly have a heart of gold dear one :o). I've so enjoyed this journey with you :o)!!!! Just beautiful Dawn. What a lovely quilt you and your gum nut friends have designed and made. You all have big heart of gold. Well done. 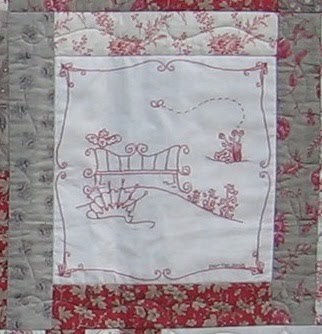 The quilt is beautiful and each block so detailed and sweet. Darling Dawnie - what a beautiful job you did with piecing this beautiful quilt! Vicki describes it perfectly - "spot on!" I love your block Dawn, and have enjoyed reading about your inspiration! It's been a marvelous journey hasnt' it?!! I just came from Jenny's blog. Absolutely one gorgeous collaborative quilt. Very beautiful quilt and what a lovely block you designed Dawn. I love the Rounneries fabrics you ladies chose, such gorgeous fabrics for a lovely quilt. Have a great week! You all have done such a wonderful thing. I love all the gorgeous blocks on this quilt. They are all so different but tie in together really well and the Rounnaries fabric is just fabulous, of course. I love the little sayings. Your block and saying is lovely.